It?s gotime for NASA?s Phoenix Mars Lander. After nearly10 months speeding across 422 million miles (679 million km), the Phoenixspacecraft is just days away from plunginginto the Martian atmosphere on Sunday to land near the north pole of Mars. ?We?ve beenworking quite hard all the way along,? said Deborah Bass, Phoenix?s deputy principalinvestigator at NASA?s Jet Propulsion Laboratory (JPL) in Pasadena, Calif. ?Thefeeling around here is that we are cautiously optimistic.? Phoenix isslated to land on the Martian arctic plains in a region called VastitasBorealis, where it will use a robotic arm to digfor water ice in the hopes of determining whether the site may have oncebeen capable of supporting primitive life. NASA?s Phoenixmission machine kicks into high gear today at 2:30 p.m. EDT (1830 GMT) with thefirst in a series of status briefings leading up to the first hoped-forsignal from the probe at 7:53 p.m. EDT (2353 GMT) on Sunday. Because of the 171million miles (275 million km) between Mars and Earth during Phoenix?s redplanet arrival, it will take signals about 15 to 20 minutes to reach NASA?s controlcenter at JPL once they?re sent. ?We?reworking at night, because that?s when the spacecraft is going to land,? Basstold SPACE.com, adding that the entire Phoenix team should now be inplace at JPL and at a primary mission control center at the University ofArizona, Tucson. ?This will be just an absolutely thrilling experience.? Clickhere for a detailed, minute-by-minute account of Phoenix?s landing day. Phoenix isthe first spacecraft to attempt a powered landing on Mars since the crash ofNASA?s ill-fated Mars Polar Lander in 1999. It follows the 2004 airbag-cushioned arrivalsof the agency?s Spirit and Opportunity - which are still active today - and wouldmark the first successful powered landing on Mars since NASA?s two Vikingspacecraft arrived in 1976. While missionengineers and researchers have worked diligently over the last 10 months to rehearsePhoenix?s landing day, the pace will definitely pick up leading into thisweekend. On Saturday,Phoenix researchers and engineers will hold another mission update at 3:00 p.m.EDT (1900 GMT), which like today?s will be broadcast live on NASA TV. Later thatnight, at about 10:46 p.m. EDT (0246 May 25 GMT), Phoenix may fire its thrustersto tweak its approach toward the Martian arctic. Anothercourse correction is available on Sunday - landing day - at 11:46 a.m. EDT (1546GMT), followed by a 3:00 p.m. EDT (1900 GMT) mission briefing before NASA kicksoff continuous live coverage at 6:30 p.m. EDT (2230 GMT). For cabletelevision subscribers without NASA TV or computer access for NASA's Sunday webcast, theScience Channel will also provide live Phoenix landing coverage and commentary from 7:00-9:00 p.m.EDT (2300-0100 GMT). 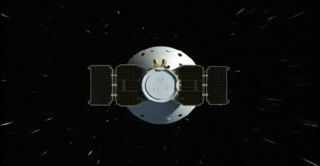 Phoenix, itself, will bounce signals off NASA and Europeanspacecraft orbiting Mars to send data and telemetry back home. Crunch timefor the Phoenix Mars Lander comes at 7:39 p.m. EDT (2339 GMT) on Sunday, whenthe spacecraft separates from its cruise stage and is only 14 minutes away fromits planned touchdown on the Martian surface. ?There area lot of events,? said Barry Goldstein, Phoenix project manager at JPL. ?Wefire 26 pyrotechnic events in the last 14 minutes of this vehicle, and each ofthose has to work perfectly for this mission to come off as we?ve planned.? Phoenix isdue to slam into the Martian atmosphere at 7:46:33 p.m. EDT (2346:33 GMT) whiletraveling at 12,600 mph (20,277 kph), ?beginning a seven-minutedescent that will be over well before mission controllers on Earth gettheir first hint that it even began. The probe is expected to deploy itsparachute about four minutes later, then drop free at 7:50:15 p.m. EDT (2350:15GMT), then drop free a few minutes later to fire its pulse rocket engines forthe final landing approach. If all goeswell, the first hint of a successful landing will come at 7:53:52 p.m. EDT(2353:52 GMT), though Phoenix will have to wait 15 minutes for the dust tosettle before deploying its vital power-generating solar panels, missionmanagers have said. ?Our highestgoal is to see if this might form a habitable environment on Mars,? said PeterSmith, Phoenix?s principal investigator at the University of Arizona, Tucson. ?There?sno signpost today that tells you where to land, and that will be life. So we?retaking a chance.? NASA?sfirst Phoenix mission briefing will be broadcast live on NASA TV, beginningwith a mission briefing today at 2:30 p.m. EDT (1830 GMT). Clickhere for SPACE.com?s Phoenix mission coverage and a linkto NASA TV.